The preferred way of treating common heart rhythm problems is actually no better — and perhaps even worse — than a simpler approach using cheaper drugs, according to new research that could affect millions of people. Doctors have long assumed that the best way to treat the heart irregularity called atrial fibrillation is to get the heart back to a regular rhythm and maintain it, using electric shock or strong drugs. Restoring normal rhythm, or sinus rhythm, was thought to reduce the risk of strokes and death, make patients feel better and allow them to stop taking blood thinners. "It just made a lot of sense. After all, God made you in sinus rhythm. So we should try to keep you there," said Dr. D. George Wyse of the University of Calgary in Alberta, the lead researcher for one large study. If that method doesn't work, doctors turn to a second approach — using simpler, usually cheaper medications to slow down the heart rate and ease symptoms, which include palpitations, dizziness and shortness of breath. The abnormal rhythm continues and patients have to keep taking blood thinners to prevent blood clots. But Wyse said doctors began questioning whether restoring a normal rhythm is really necessary. After all, the drugs do not work very well and can have serious side effects, including triggering a potentially fatal irregular heartbeat, he said. And new data showed blood thinners were effective in preventing strokes in patients with atrial fibrillation. The two approaches were compared in studies reported in Thursday's New England Journal of Medicine. In a study of 4,060 patients in the United States and Canada, researchers found there was no significant difference in survival in the two groups and a hint of better survival in the rate-control group. There was no difference in the number of strokes and the rhythm-control group had more hospitalizations and more serious side effects. "So all the things that were thought to be benefits of rhythm control were not confirmed and, in fact, some of the things favored rate control," Wyse said. A smaller study of 522 patients in the Netherlands showed similar results. 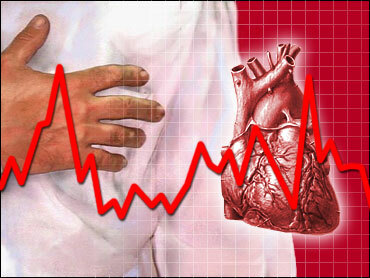 Atrial fibrillation affects more than 2 million Americans, mostly the elderly. It occurs when the upper chambers of the heart quiver instead of beating regularly. High blood pressure and heart disease are key causes. While the condition is not initially life-threatening, blood clots can form in the heart and cause strokes. Some people do not feel any symptoms and episodes can be sporadic. Dr. Rodney H. Falk of Boston University School of Medicine said he has already changed his practice because of the latest findings, and he expects other doctors to reconsider their treatment method, especially for older patients like those in the studies. "I think they'll think twice before using antiarrhythmics," Falk said. If patients feel better after their heart rate is slowed down, "we shouldn't get too uptight as physicians and say, 'But I want to make your electrocardiogram look nice and stable,'" he said. He added that restoring rhythm may be appropriate for some, including younger people. The research also highlights the need for longer use of blood thinners, regardless of treatment, said Dr. Yves Rosenberg of the National Heart, Lung and Blood Institute, which sponsored the study. Most of the strokes occurred in patients who had stopped taking a blood thinner or were on a dose that was too low. In the North American study, patients with atrial fibrillation were randomly assigned to one of the two treatment methods and followed for an average of 3½ years. Doctors could choose from a number of drugs in each group and change drugs if necessary. In the rhythm-control group, available drugs included amiodarone (sold as Cordarone or Pacerone), propafenone (Rythmol), and sotalol (Betapace). Drugs used to slow the heart rate were beta-blockers, calcium-channel blockers and digoxin. Both groups got blood thinners. There was statistically no difference in the death rates: 356 deaths in the rhythm-control group and 310 in the rate-control group.